Word & Character Counter is a free Windows 8 word count app available under “Productivity” category of its App Store. 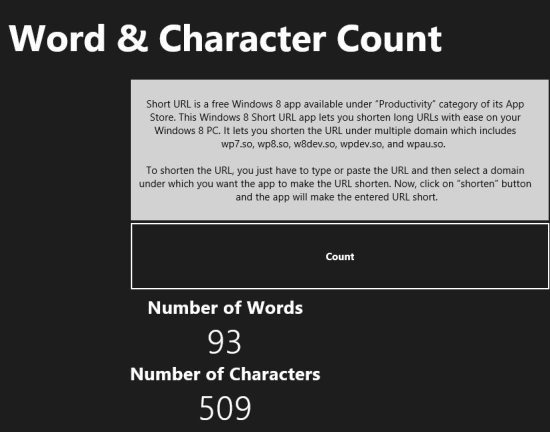 This word count Windows 8 app lets you count words in a paragraph. In addition, the app also provides the character count in a paragraph. You just have to copy and paste the whole text in the app text field and hit on count button. The app will automatically count all the words and characters and will give the total of it. Well, this Windows 8 word count app is one of the simplest apps to have the word and character count of a paragraph. Also, if we talk about the interface, then I can surely say that it has one of the simplest user-interface to understand and use. The app is useful when you are typing in the text field like Windows notepad where you don’t have any option to count number of words in it. Also, while browsing websites over the Internet, many a times you come across a webpage containing an article for which you want to have the word count or sometimes even its character count. This is where, the app proves to be useful. The good part of this Windows 8 word count app is that it completely works offline. Just enter the text and the app will simple give you its word and character count. Remember: This Windows 8 word count app does not allow you to copy the pictures if you have any in the paragraph or the text you copied. Also, check out our posts on App to Shorten URLs, Word Counter Apps. Count number of words and characters in a paragraph. Lets you copy and paste the text. To download and install Word & Character Counter app, just login to your Windows 8 App Store. Now, search for “Word & Character Counter“ app, and click on install button. You are now ready to enjoy this awesome productivity app. I don’t have much to explain about this word count Windows 8 app, but yes, I would just say that this app really rocks. It can make your work simpler by giving you word count where you don’t have the option. Now, you don’t need any heavy software or any online application to count words and character. Just use your Windows 8 and install this app to effectively count words for you.